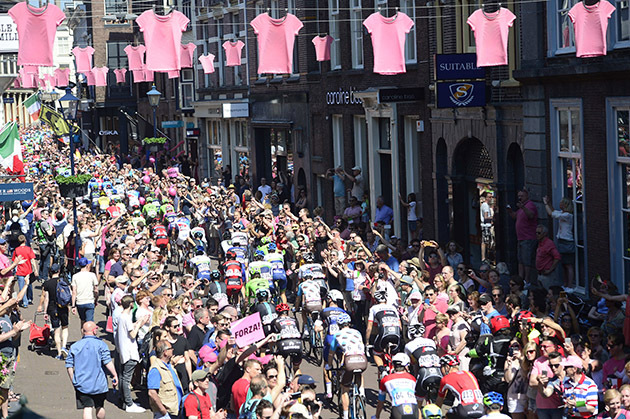 The German rider Marcel Kittel (Etixx – Quick Step) won the bunch sprint which decided Stage 2 of the 99th Giro d’Italia, 190km from Arnhem to Nijmegen. Arnaud Demare (FDJ) and Sacha Modolo (Lampre – Merida) finished second and third. 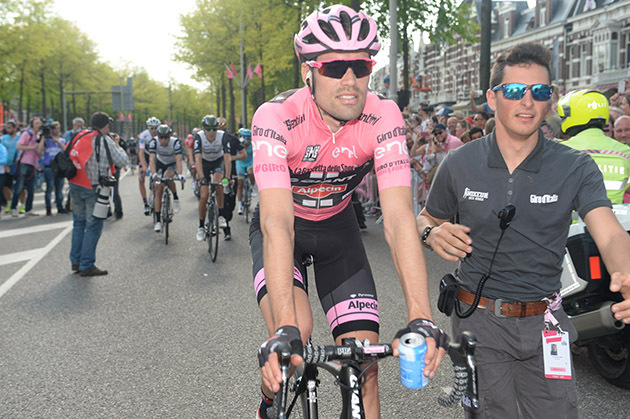 Dutch rider Tom Dumoulin (Team Giant – Alpecin) retained the race lead and kept the Maglia Rosa. 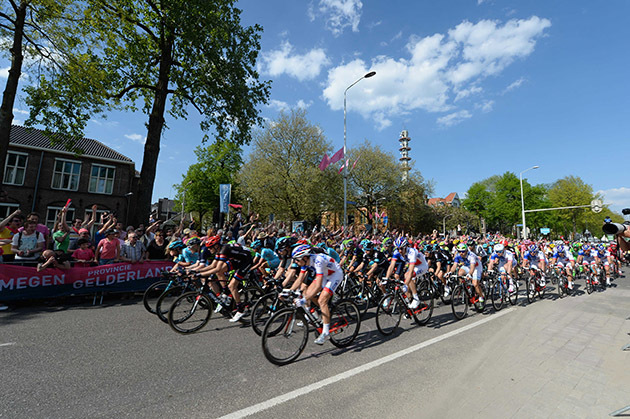 Speaking seconds after the stage finish, the stage winner Marcel Kittel said: “Firstly I want to say chapeau to the people of the Netherlands for the great atmosphere on the road today. 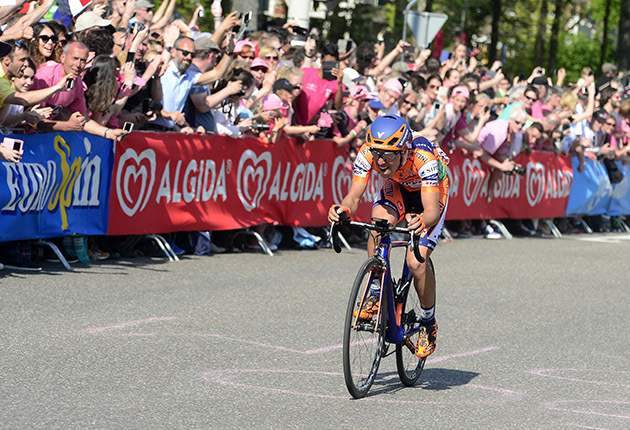 I’m super happy to win the first bunch sprint of the Giro. Yesterday, the time trial was a good sign of my form. Today my team did a very good job to bring me to the front. I had to get through a few gaps to reach the front of the group. It was a tricky finale and I’m very happy with how it went. 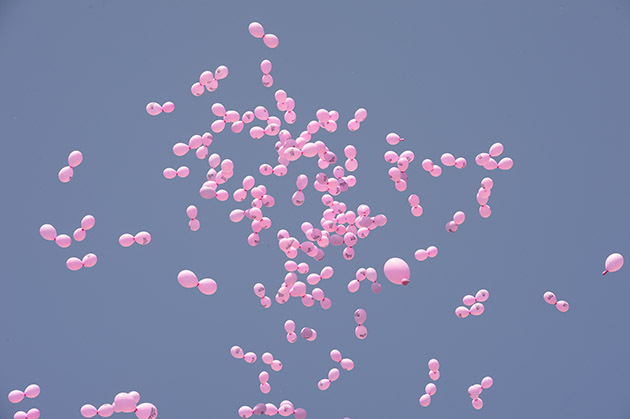 Now I’m one second away from the pink jersey. Step by step, I’m getting there”. 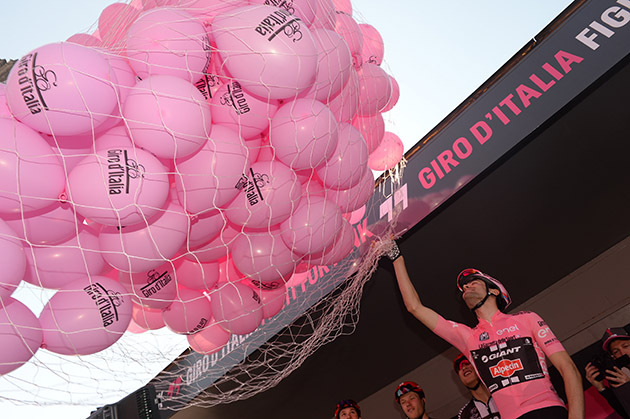 Race leader Tom Dumoulin said: “The whole race was a party! There were crowds everywhere. 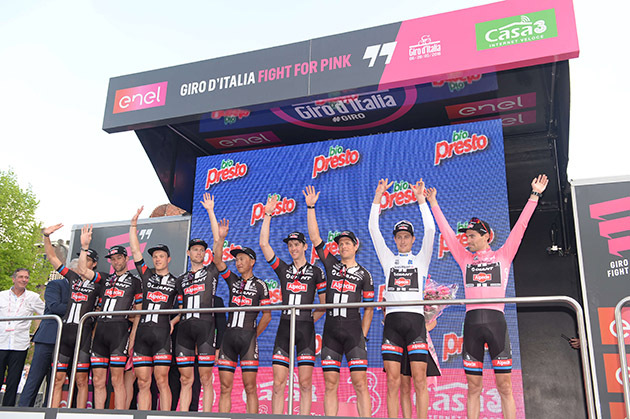 I enjoyed the moment because my team helped me keep the pink jersey in a really good way. 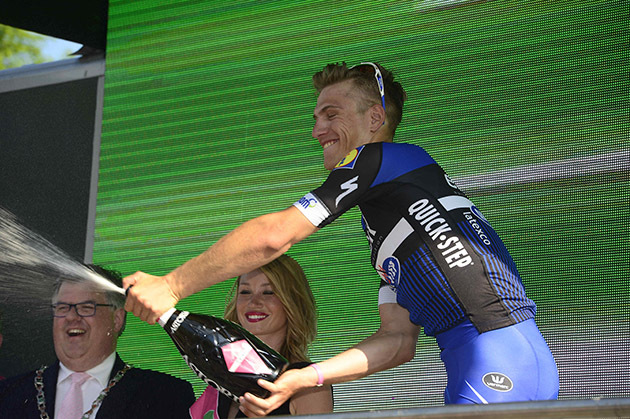 Now Marcel Kittel is close in GC but the party continues”. 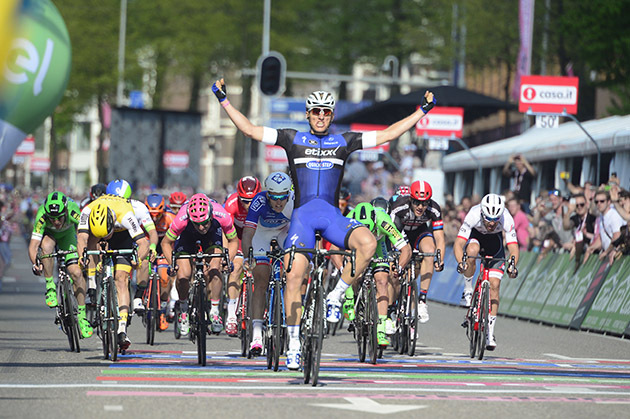 Nijmegen witnessed a dominant victory of Marcel Kittel, as he took his 12th career success in a Grand Tour. As the Giro d'Italia loomed on the horizon, Marcel Kittel stressed out that he's not just motivated for the first Grand Tour of the year, but also that he's enjoying his best ever spring, with no less than eight victories already to his name, among which was also a record fourth victory in Scheldeprijs. 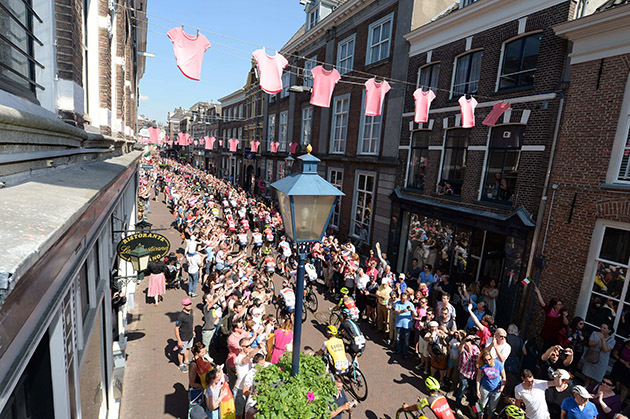 Confident in his and the team's strength, Marcel knew he wouldn't have to wait more to notch yet another win, which eventually came when everyone was expecting it, on the second day of the Corsa Rosa, in the Dutch city of Nijmegen. 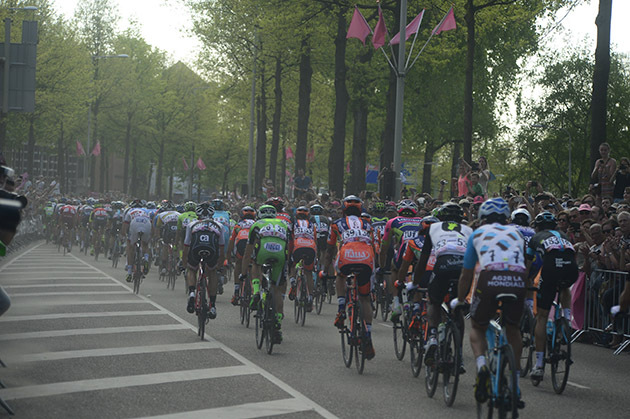 Racing his second Giro d'Italia, Kittel patiently kept his powder dry throughout the day, as the peloton controlled a three-man break which took off right after the start and was caught with less than 10 kilometers to go. The 27-year-old waited for the team to safely negotiate the final kilometers of the stage, as Bob Jungels, Fabio Sabatini, Matteo Trentin and Lukasz Wisniowski did a great job by bringing him at top end of the bunch. Then, inside the last 200 meters, just as FDJ was trying to hit the front in the rush to the line, Marcel opened his devastating sprint, leaving everyone else behind and scoring an impressive victory, thus rekindling his long-standing relationshis with the Grand Tours, where he scored 12 wins so far. 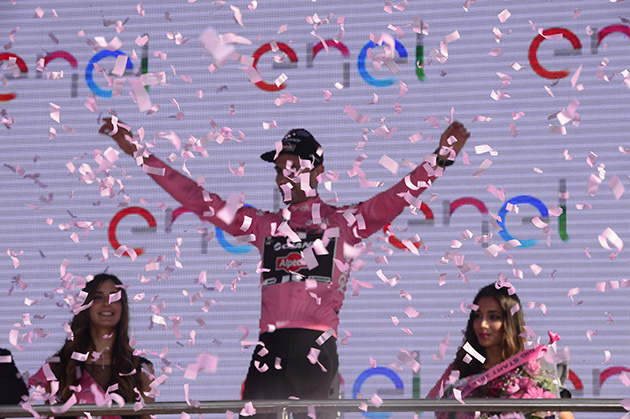 After hitting the ground running at the Giro d'Italia and making two visits to the podium On Sunday – one for the stage victory and one to get the red jersey, of the points classification leader – Marcel sat down and talked about his day in the Netherlands, where he enjoyed not only his 9th success of the season, but also the fantastic and overwhelming atmosphere created by the thousands and thousands of Dutch fans lined up on the road. "I was feeling really good today and started my sprint in a perfect moment. The team boxed its way through the peloton on the right side, it was incredible what they did and I'm very proud to see how strong the guys were. With the finish being in a downhill, I knew it was perfect for me and kicked-off my sprint with confidence. Winning the stage with a small gap was even better, especially as it came at the end of an incredible day. The fans were outstanding and supported us all the time, it was like a big party out there. I must say, the finish in Nijmegen was one of the most amazing I've ever seen", said Marcel after bringing Etixx – Quick-Step its 24th victory of the season. 3 MODOLO Sacha LAMPRE-MERIDA s.t. 4 HOFLAND Moreno LOTTO NL-JUMBO s.t. 5 RUFFONI Nicola BARDIANI-CSF s.t. 6 PORSEV Alexander KATUSHA s.t. 7 EWAN Caleb ORICA-GREENEDGE s.t. 8 SBARAGLI Kristian DIMENSION DATA s.t. 9 AMADOR Andrey MOVISTAR s.t. 10 NIZZOLO Giacomo TREK-SEGAFREDO s.t. 11 SIMION Paolo BARDIANI-CSF s.t. 12 ARNDT Nikias GIANT-ALPECIN s.t. 13 VIVIANI Elia SKY s.t. 14 GROSU Eduard Michael NIPPO-VINI FANTINI s.t. 15 GREIPEL André LOTTO-SOUDAL s.t. 16 TCATEVITCH Alexey KATUSHA s.t. 17 ZABEL Rick BMC s.t. 18 CHAVES Esteban ORICA-GREENEDGE s.t. 19 DILLIER Silvan BMC s.t. 20 OSS Daniel BMC s.t. 21 KUZNETSOV Viacheslav KATUSHA s.t. 22 LUDVIGSSON Tobias GIANT-ALPECIN s.t. 23 PELUCCHI Matteo IAM CYCLING s.t. 24 KRUIJSWIJK Steven LOTTO NL-JUMBO s.t. 25 CLARKE Simon CANNONDALE s.t. 26 MALACARNE Davide ASTANA s.t. 27 DELAGE Mickael FDJ s.t. 28 NIBALI Vincenzo ASTANA s.t. 29 SAVITSKIY Ivan GAZPROM-RUSVELO s.t. 30 AGNOLI Valerio ASTANA s.t. 31 MAJKA Rafal TINKOFF s.t. 33 BRAMBILLA Gianluca ETIXX-QUICK STEP s.t. 34 ROCHE Nicholas SKY s.t. 35 KOLOBNEV Alexandr GAZPROM-RUSVELO s.t. 36 DUMOULIN Tom GIANT-ALPECIN s.t. 37 JUNGELS Bob ETIXX-QUICK STEP s.t. 38 ULISSI Diego LAMPRE-MERIDA s.t. 39 ROJAS GIL Jose Joaquin MOVISTAR s.t. 40 LANDA Mikel SKY s.t. 41 PREIDLER Georg GIANT-ALPECIN s.t. 42 MARECZKO Jakub WILIER TRIESTINA s.t. 43 COLBRELLI Sonny BARDIANI-CSF s.t. 44 MAESTRI Mirco BARDIANI-CSF s.t. 45 DE LA CRUZ David ETIXX-QUICK STEP s.t. 46 HOWARD Leigh IAM CYCLING s.t. 47 KOCHETKOV Pavel KATUSHA s.t. 49 BOARO Manuele TINKOFF s.t. 50 VAN ZYL Johann DIMENSION DATA s.t. 51 GENIEZ Alexandre FDJ s.t. 52 CARDOSO Andre Fernando CANNONDALE s.t. 53 GRETSCH Patrick AG2R-LA MONDIALE s.t. 54 ZHUPA Eugert WILIER TRIESTINA s.t. 55 KLUGE Roger IAM CYCLING s.t. 56 HENAO Sebastian SKY s.t. 57 WELLENS Tim LOTTO-SOUDAL s.t. 58 ERSHOV Artur GAZPROM-RUSVELO s.t. 59 MCCARTHY Jay TINKOFF s.t. 60 BETANCUR Carlos A. MOVISTAR s.t. 61 ROGLIC Primoz LOTTO NL-JUMBO s.t. 62 BONNAFOND Guillaume AG2R-LA MONDIALE s.t. 63 ZAKARIN Ilnur KATUSHA s.t. 64 FORMOLO Davide CANNONDALE s.t. 65 ROVNY Ivan TINKOFF s.t. 66 KNEES Christian SKY s.t. 67 FUGLSANG Jakob ASTANA s.t. 68 SCARPONI Michele ASTANA s.t. 69 MARTINEZ Daniel WILIER TRIESTINA s.t. 70 ALAFACI Eugenio TREK-SEGAFREDO s.t. 71 SIUTSOU Kanstantsin DIMENSION DATA s.t. 72 MONTAGUTI Matteo AG2R-LA MONDIALE s.t. 73 VALVERDE Alejandro MOVISTAR s.t. 74 MORI Manuele LAMPRE-MERIDA s.t. 75 SABATINI Fabio ETIXX-QUICK STEP s.t. 76 KOZHATAYEV Bakhtiyar ASTANA s.t. 77 BRUTT Pavel TINKOFF s.t. 78 FIRSANOV Sergey GAZPROM-RUSVELO s.t. 79 BRANDLE Matthias IAM CYCLING s.t. 80 KANGERT Tanel ASTANA s.t. 81 SENNI Manuel BMC s.t. 82 SOLOMENNIKOV Andrey GAZPROM-RUSVELO s.t. 83 ATAPUMA Darwin BMC s.t. 84 LAENGEN Vegard Stake IAM CYCLING s.t. 85 DOMONT Axel AG2R-LA MONDIALE s.t. 86 WARBASSE Lawrence IAM CYCLING s.t. 87 PERAUD Jean Christophe AG2R-LA MONDIALE s.t. 88 MONFORT Maxime LOTTO-SOUDAL s.t. 89 CONTI Valerio LAMPRE-MERIDA s.t. 90 TAARAMAE Rein KATUSHA s.t. 91 POZZOVIVO Domenico AG2R-LA MONDIALE s.t. 92 VOROBYEV Anton KATUSHA s.t. 93 HERNANDEZ Jesus TINKOFF s.t. 94 STACCHIOTTI Riccardo NIPPO-VINI FANTINI s.t. 95 PIRAZZI Stefano BARDIANI-CSF s.t. 96 KEIZER Martijn LOTTO NL-JUMBO s.t. 97 COLEDAN Marco TREK-SEGAFREDO s.t. 98 BUSATO Matteo WILIER TRIESTINA s.t. 99 HESJEDAL Ryder TREK-SEGAFREDO s.t. 100 VAN EMDEN Jos LOTTO NL-JUMBO s.t. 101 THOMSON Jay Robert DIMENSION DATA s.t. 102 ANTON HERNANDEZ Igor DIMENSION DATA s.t. 103 BETTIOL Alberto CANNONDALE s.t. 104 MOSER Moreno CANNONDALE s.t. 105 KUDUS GHEBREMEDHIN Merhawi DIMENSION DATA s.t. 106 KONOVALOVAS Ignatas FDJ s.t. 107 MEZGEC Luka ORICA-GREENEDGE s.t. 108 PETROV Evgeny TINKOFF s.t. 109 MOHORIC Matej LAMPRE-MERIDA s.t. 110 PETILLI Simone LAMPRE-MERIDA s.t. 111 SARREAU Marc FDJ s.t. 112 NIEVE Mikel SKY s.t. 113 VAN POPPEL Boy TREK-SEGAFREDO s.t. 114 BATTAGLIN Enrico LOTTO NL-JUMBO s.t. 115 POLJANSKI Pawel TINKOFF s.t. 116 HOULE Hugo AG2R-LA MONDIALE s.t. 117 SEROV Alexander GAZPROM-RUSVELO s.t. 118 TXURRUKA Amets ORICA-GREENEDGE s.t. 119 PLAZA MOLINA Ruben ORICA-GREENEDGE s.t. 120 WYSS Marcel IAM CYCLING s.t. 121 HOWSON Damien ORICA-GREENEDGE s.t. 122 HAUSSLER Heinrich IAM CYCLING s.t. 123 OVECHKIN Artem GAZPROM-RUSVELO s.t. 124 RYBALKIN Aleksey GAZPROM-RUSVELO s.t. 125 TOSATTO Matteo TINKOFF s.t. 126 TANKINK Bram LOTTO NL-JUMBO s.t. 127 FISCHER Murilo Antonio FDJ s.t. 128 NIEMIEC Przemyslaw LAMPRE-MERIDA s.t. 129 RODRIGUEZ Cristian WILIER TRIESTINA s.t. 130 DOMBROWSKI Joseph Lloyd CANNONDALE s.t. 131 TRENTIN Matteo ETIXX-QUICK STEP s.t. 132 BELLETTI Manuel WILIER TRIESTINA s.t. 133 AMEZQUETA Julen WILIER TRIESTINA s.t. 134 CASTELIJNS Twan LOTTO NL-JUMBO s.t. 135 BONGIORNO Francesco Manuel BARDIANI-CSF s.t. 136 CICCONE Giulio BARDIANI-CSF s.t. 137 DUPONT Hubert AG2R-LA MONDIALE s.t. 138 ZOIDL Riccardo TREK-SEGAFREDO s.t. 139 BELKOV Maxim KATUSHA s.t. 140 BOBRIDGE Jack TREK-SEGAFREDO s.t. 141 DIDIER Laurent TREK-SEGAFREDO s.t. 142 VISCONTI Giovanni MOVISTAR s.t. 143 ROELANDTS Jurgen LOTTO-SOUDAL s.t. 144 KOSHEVOY Ilia LAMPRE-MERIDA s.t. 145 SERRY Pieter ETIXX-QUICK STEP s.t. 146 MORENO Javier MOVISTAR s.t. 147 HAGA Chad GIANT-ALPECIN s.t. 148 CAPECCHI Eros ASTANA s.t. 150 BERTAZZO Liam WILIER TRIESTINA s.t. 151 SILIN Egor KATUSHA s.t. 152 BROWN Nathan CANNONDALE s.t. 153 NAVARDAUSKAS Ramunas CANNONDALE s.t. 154 ZEITS Andrey ASTANA s.t. 155 BOSWELL Ian SKY s.t. 156 DE BIE Sean LOTTO-SOUDAL s.t. 157 QUINZIATO Manuel BMC s.t. 158 ROSSKOPF Joseph BMC s.t. 159 DE MARCHI Alessandro BMC s.t. 160 FOLIFOROV Alexander GAZPROM-RUSVELO s.t. 161 ZILIOLI Gianfranco NIPPO-VINI FANTINI s.t. 162 LIGTHART Pim LOTTO-SOUDAL s.t. 163 COURTEILLE Arnaud FDJ s.t. 164 VERONA Carlos ETIXX-QUICK STEP s.t. 165 WISNIOWSKI Lukasz ETIXX-QUICK STEP s.t. 167 BISOLTI Alessandro NIPPO-VINI FANTINI s.t. 168 KADRI Blel AG2R-LA MONDIALE s.t. 169 CUNEGO Damiano NIPPO-VINI FANTINI s.t. 170 LOPEZ GARCIA David SKY s.t. 171 HEPBURN Michael ORICA-GREENEDGE s.t. 172 FERRARI Roberto LAMPRE-MERIDA s.t. 173 TUFT Svein ORICA-GREENEDGE s.t. 174 YAMAMOTO Genki NIPPO-VINI FANTINI s.t. 182 FRAILE MATARRANZ Omar DIMENSION DATA s.t. 183 JIM Songezo DIMENSION DATA s.t. 184 SUTTERLIN Jasha MOVISTAR s.t. 185 SUTHERLAND Rory MOVISTAR s.t. 186 DEIGNAN Philip SKY s.t. 187 BOEM Nicola BARDIANI-CSF s.t. 188 ANDREETTA Simone BARDIANI-CSF s.t. 189 FILOSI Iuri NIPPO-VINI FANTINI s.t. 195 CANCELLARA Fabian TREK-SEGAFREDO s.t. 196 VENTER Jacobus DIMENSION DATA s.t. 197 JI Cheng GIANT-ALPECIN s.t. 2 ROGLIC Primoz LOTTO NL-JUMBO s.t. 10 KLUGE Roger IAM CYCLING s.t. 11 HAGA Chad GIANT-ALPECIN s.t. 13 KEIZER Martijn LOTTO NL-JUMBO s.t. 16 HOWSON Damien ORICA-GREENEDGE s.t. 18 HEPBURN Michael ORICA-GREENEDGE s.t. 20 KANGERT Tanel ASTANA s.t. 25 NAVARDAUSKAS Ramunas CANNONDALE s.t. 28 FUGLSANG Jakob ASTANA s.t. 29 WELLENS Tim LOTTO-SOUDAL s.t. 32 CHAVES Esteban ORICA-GREENEDGE s.t. 33 KUNG Stefan BMC s.t. 34 HOWARD Leigh IAM CYCLING s.t. 36 DE BIE Sean LOTTO-SOUDAL s.t. 38 SERRY Pieter ETIXX-QUICK STEP s.t. 39 VISCONTI Giovanni MOVISTAR s.t. 41 PLAZA MOLINA Ruben ORICA-GREENEDGE s.t. 42 URAN URAN Rigoberto CANNONDALE s.t. 44 DEMARE Arnaud FDJ s.t. 46 GREIPEL André LOTTO-SOUDAL s.t. 48 ROELANDTS Jurgen LOTTO-SOUDAL s.t. 49 VOROBYEV Anton KATUSHA s.t. 50 KONOVALOVAS Ignatas FDJ s.t. 52 QUINZIATO Manuel BMC s.t. 53 OSS Daniel BMC s.t. 54 KNEES Christian SKY s.t. 56 SEROV Alexander GAZPROM-RUSVELO s.t. 57 TCATEVITCH Alexey KATUSHA s.t. 59 PORSEV Alexander KATUSHA s.t. 60 PERAUD Jean Christophe AG2R-LA MONDIALE s.t. 61 TAARAMAE Rein KATUSHA s.t. 62 MONFORT Maxime LOTTO-SOUDAL s.t. 64 MCCARTHY Jay TINKOFF s.t. 65 SIUTSOU Kanstantsin DIMENSION DATA s.t. 66 PIRAZZI Stefano BARDIANI-CSF s.t. 68 BETTIOL Alberto CANNONDALE s.t. 69 AGNOLI Valerio ASTANA s.t. 71 LOPEZ GARCIA David SKY s.t. 72 ZABEL Rick BMC s.t. 73 ROSSKOPF Joseph BMC s.t. 75 WYSS Marcel IAM CYCLING s.t. 76 OVECHKIN Artem GAZPROM-RUSVELO s.t. 77 ERSHOV Artur GAZPROM-RUSVELO s.t. 79 BRUTT Pavel TINKOFF s.t. 81 SCARPONI Michele ASTANA s.t. 82 COLEDAN Marco TREK-SEGAFREDO s.t. 83 LIGTHART Pim LOTTO-SOUDAL s.t. 84 TOSATTO Matteo TINKOFF s.t. 86 VAN POPPEL Boy TREK-SEGAFREDO s.t. 87 SABATINI Fabio ETIXX-QUICK STEP s.t. 89 BERTAZZO Liam WILIER TRIESTINA s.t. 90 CONTI Valerio LAMPRE-MERIDA s.t. 91 WARBASSE Lawrence IAM CYCLING s.t. 92 MARTINEZ Daniel WILIER TRIESTINA s.t. 96 FIRSANOV Sergey GAZPROM-RUSVELO s.t. 97 DOMBROWSKI Joseph Lloyd CANNONDALE s.t. 98 BRAMBILLA Gianluca ETIXX-QUICK STEP s.t. 99 ROJAS GIL Jose Joaquin MOVISTAR s.t. 100 HOULE Hugo AG2R-LA MONDIALE s.t. 101 HENAO Sebastian SKY s.t. 103 BATTAGLIN Enrico LOTTO NL-JUMBO s.t. 104 TXURRUKA Amets ORICA-GREENEDGE s.t. 106 MODOLO Sacha LAMPRE-MERIDA s.t. 108 BOSWELL Ian SKY s.t. 109 VAN ZYL Johann DIMENSION DATA s.t. 113 HAUSSLER Heinrich IAM CYCLING s.t. 115 DOMONT Axel AG2R-LA MONDIALE s.t. 116 ROVNY Ivan TINKOFF s.t. 117 COURTEILLE Arnaud FDJ s.t. 119 KOCHETKOV Pavel KATUSHA s.t. 122 MOHORIC Matej LAMPRE-MERIDA s.t. 123 KOZHATAYEV Bakhtiyar ASTANA s.t. 126 NIEMIEC Przemyslaw LAMPRE-MERIDA s.t. 127 PETILLI Simone LAMPRE-MERIDA s.t. 128 PETROV Evgeny TINKOFF s.t. 130 MEZGEC Luka ORICA-GREENEDGE s.t. 131 DELAGE Mickael FDJ s.t. 133 KUZNETSOV Viacheslav KATUSHA s.t. 134 FOLIFOROV Alexander GAZPROM-RUSVELO s.t. 135 MALACARNE Davide ASTANA s.t. 138 NIEVE Mikel SKY s.t. 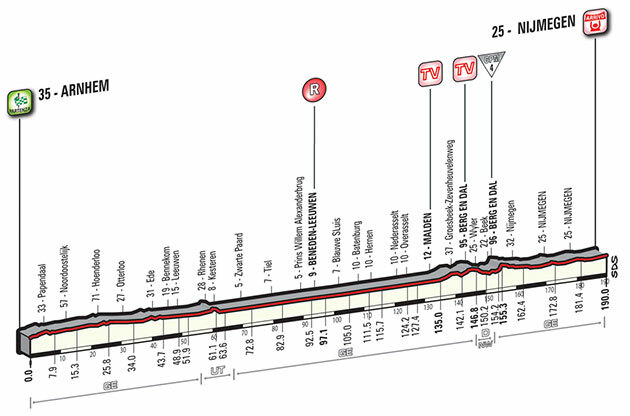 139 SBARAGLI Kristian DIMENSION DATA s.t. 140 POZZATO Filippo WILIER TRIESTINA s.t. 142 MAESTRI Mirco BARDIANI-CSF s.t. 144 POLJANSKI Pawel TINKOFF s.t. 145 BUSATO Matteo WILIER TRIESTINA s.t. 146 CICCONE Giulio BARDIANI-CSF s.t. 150 DE BACKER Bert GIANT-ALPECIN s.t. 151 ATAPUMA Darwin BMC s.t. 153 ANTON HERNANDEZ Igor DIMENSION DATA s.t. 157 DUPONT Hubert AG2R-LA MONDIALE s.t. 158 RYBALKIN Aleksey GAZPROM-RUSVELO s.t. 166 BONGIORNO Francesco Manuel BARDIANI-CSF s.t. 167 CUNEGO Damiano NIPPO-VINI FANTINI s.t. 171 BONNAFOND Guillaume AG2R-LA MONDIALE s.t. 172 EWAN Caleb ORICA-GREENEDGE s.t. 180 MARECZKO Jakub WILIER TRIESTINA s.t. 181 BAK Lars Ytting LOTTO-SOUDAL s.t.